Holidaymaker’s nightmare - working against the clock to minimise complications. The whole story: A client’s customer was holidaying in Lanzarote with his wife when he suffered a fall, sustaining a fracture to his right hip requiring an operation. When Healix received the case notification they knew they needed to act fast. 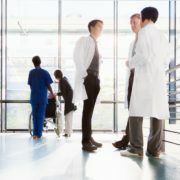 Healix’s in-house medical team obtained medical information directly from the treating medical facility. Upon our review, we stressed that the surgery needed to take place within 48 hours of the admission. It is essential that surgery for hip fractures is performed swiftly. Delays not only increase the risk of complications but they also make it less likely that the patient will return to full mobility. Within just 6 hours of receipt of the initial notification, our team obtained all information required to assess coverage under the terms of the policy, obtained all medical information, confirmed coverage and organised transfer to an appropriate networked medical facility that could perform the operation within the required timescales. After a successful operation, the patient began the road to recovery. Our assistance co-ordinators kept in daily contact with next of kin, giving medical updates on the patient’s progress. Given that the accident occurred close to the patient’s return date, Healix organised extended accommodation for the insured’s wife to remain overseas with the patient. Once the patient had been deemed fit to fly by both our medical team and the treating doctor, we made the necessary arrangements to fly the patient back to the UK, including road transfers and arranging wheelchair assistance and additional seating on board the aircraft. All medical expenses were taken care of directly with the treating medical facility and the patient made a good recovery.